It’s a little early for Thanksgiving, but one thing for which I am thankful is how circumstance led me all the way from Texas to Virginia Beach, VA last April to complete my SFG Recertification with Master SFG Karen Smith at her former gym Kettlebell-Elite. The opportunity to work with one of the best instructors on the planet has been priceless for development as an instructor and in my own training. 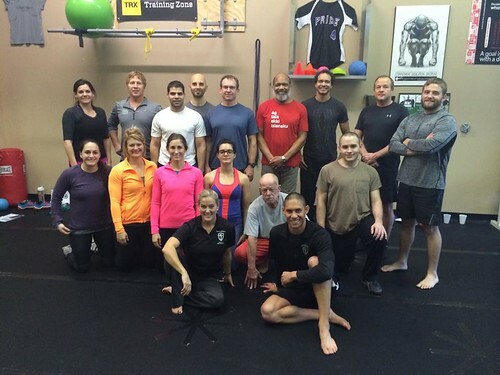 A couple weeks ago, I had the honor of assisting Karen at another one of her StrongFirst Bodyweight courses, most recently held at ValeoFIT in Houston, hosted by Tony LeCara. 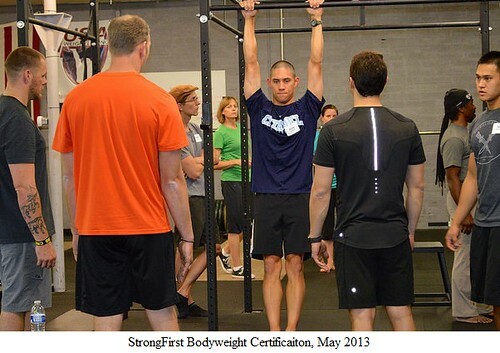 I’ve written prior recaps on the SFB Bodyweight Certification and Karen’s StrongFirst Bodyweight User course in La Jolla. Fortunately, each event is so rich with content that I can easily fill a new post with fresh material (though some points are inevitably worth repeating)! Like most StrongFirst events, the students came from very high levels of strength practice…several top echelon trainers, two physical therapists, three current SFG kettlebell instructors, and a chiropractor (who traveled to Texas from Oregon for this course!!). For those unfamiliar, the user course follows a similar template as the SFB certification, but covers only one day (not two) and omits the handstand training. Further, there is no certification testing at the one day course, but many attendees subsequently use the course as a foundation to later purse the cert. Though the courses tend to attract trainers and medical professionals, the course is equally suited for fitness enthusiasts of all levels. This course is equally cerebral and physical, but students are often spent by the end (in a good way, not muscle failure!!!). There is not a single lift you perform on autopilot. But because you rarely perform more than five reps of anything (singles are more common), you never reach physical exhaustion. The purpose is technical proficiency, not physical beat down! But strength may also improve mobility. Immobility may be the body’s subconscious way of “putting on the brakes.” Strength and control may allow for expression of mobility that’s already there. 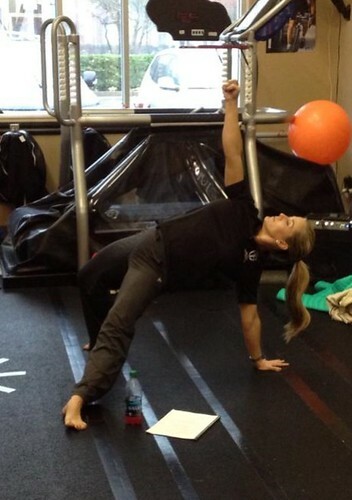 Mobility training has a purpose, often tied to the primary lifts. For example, the back bridge, prone press ups, and TGU high bridge are all techniques to counteract the hollow position. Hollow is essential for bar work (tactical pull ups, hanging leg raise), but too much of a good thing can be a bad thing! 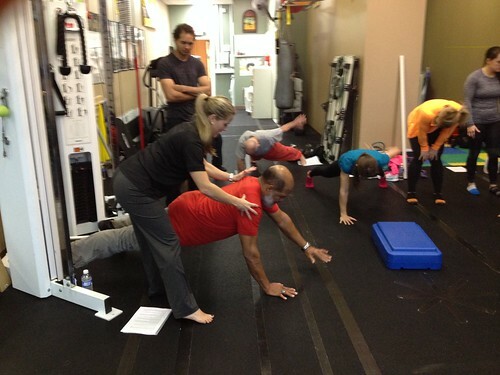 Different purposes of mobility exercises…Some mobility exercises are used to counterbalance repetitive use patterns (see point above), while others are used to enable proper execution (90-90 stretch for pistols, T-spine mobility for bar work and one arm push-ups). And in general, each can be used at the end of a session or in the evening to decompress. For many people, the initial progressions seem almost rudimentary. Why spend time nitpicking regular two arm pushups, when most male students can rep out dozens at a time? Every detail matters. Much more effective to learn these details in easy progressions than to face-plant during one arm push up attempts!! Even if you are into high rep bodyweight work (Crossfit, military fitness testing), increasing max tension makes everything else easier. Event-specific work is still needed for max rep tests, but general strength raises the foundation. Maximizing hand pressure and foot pressure into the floor. This minimizes strength leakage and creates a more robust pillar to transmit energy. Hand pressure is often a forgotten detail. Common error is to roll onto the outside/lateral portion of the hand, wasting stability points from other areas. Strength should have an aesthetic quality. Make the difficult look easy. Showcase how well you carry your strength. Bodyweight is a great opportunity to focus on the qualitative aspects of the lifts, since there is no number on the side of the weight for us to obsess over! One arm push up (and one arm one leg) relationship with the military press is likely the most direct transfer of bodyweight to kettlebell lifts. Very subtle weight shift is key for one arm pushups and military press. One arm push up (or any push up for that matter) is as much a PULL as a PUSH. Grease the groove – by far the best way to train for bodyweight. This is essentially how gymansts/acrobats train. Grease the groove doesn’t have to be all day affair. Can be an hour set aside for grease the groove within that hour. Who says ladies can’t do pull ups? Eye position – looking up at bar during pull ups and hanging leg raise can disengage the core. Gaze should stay forward. Tactical pull up – use thumbless grip. When ascending a wall in “real world” tactical activities you can’t wrap the thumb around (and you can’t kip). Nothing wrong with thumb grip but be able to perform thumbless. And like many StongFirst events, the course included representation from people who actually work in tactical environments…. (Houston Fire, US Marine Corps, US Army). If you fail, fail like a professional. Stay tight and lower yourself calmly to the ground. No hapless failing like a novice. There is no “best” lower body exercise, but the single leg deadlift is very close. 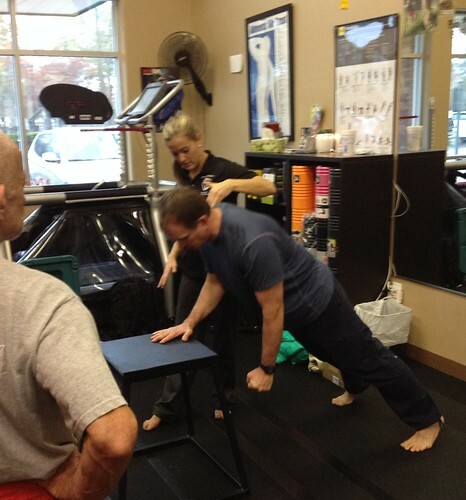 Several options available (Weight contralateral, ipsilateral, bilateral…kettlebell, barbell, unweighted). 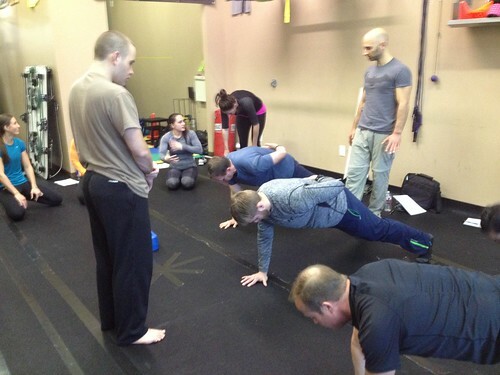 Transfers into pistol, pushup, hip hinge, and even one arm pushup. Though I previously called the bodyweight curriculum a “hidden gem”, fortunately the it will become less “hidden” this year with several certifications and courses already on the calendar, beginning with Karen’s world tour of NYC, South Africa, and Australia. 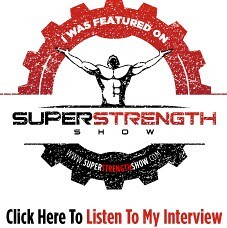 For course listings, visit Karen’s website (Coach Karen Smith) and the StrongFirst website. Thanks for reading!